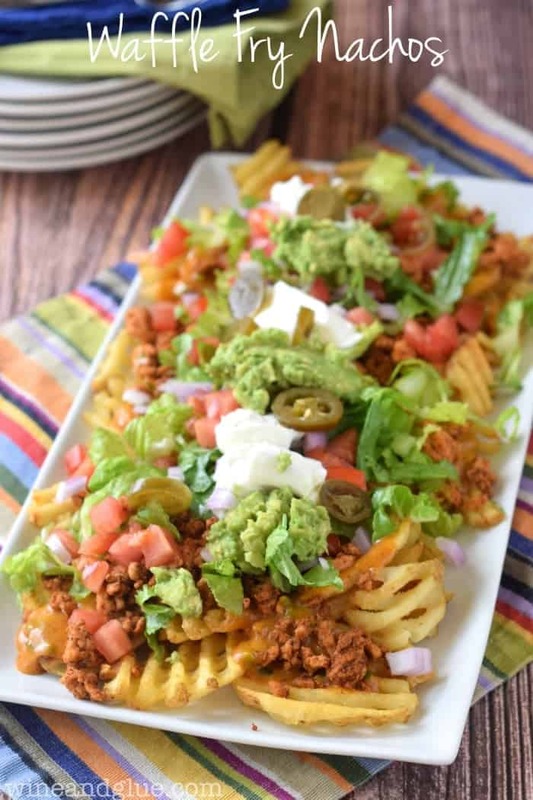 Waffle Fry Nachos | Delicious nachos made with lean meat, tons of veggies, and a homemade queso sauce, all over crispy waffle fries! Before we had kids, Nathan and I went out to eat . . . a lot. I think that’s pretty typical, right? What maybe wasn’t typical was the type of restaurants we went to eat at. We made some . . . . dubious choices. Our friends who already had kids would look at us in horror when we told them about the restaurant that we had gone to the night before, very often a suburban chain. But there’s a reason for it!!! Nachos are seriously a weakness of Nathan and mine. I luuuurve them. I mean, they are like a work of art with their layered flavors and textures . . . okay, I’m drooling now. This is embarrassing. But really, nachos aren’t that hard to make at home! And when you make them at home you can make them so much better than you can when you eat out, like making a homemade queso sauce with lower fat milk and minimal other ingredients. And using a lean meat with just a few simple and delicious spices. 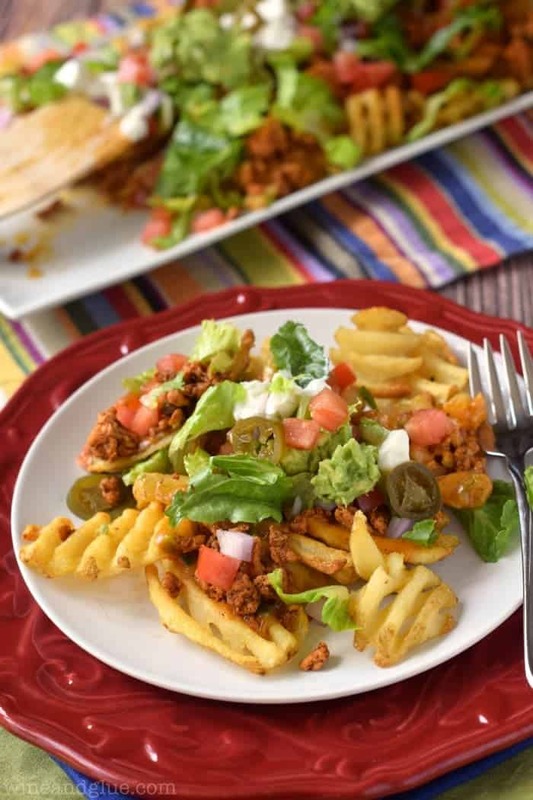 Well, I just took nachos to a NEW level by taking out the chips and throwing in Ore-Ida® Waffle Fries! This is a meal that I totally feel good about. It’s full of flavor and better yet, fresh veggies. Ore-Ida® Waffle Fries are made with 100% fresh American grown potatoes. And they are super easy and convenient, making them absolutely perfect for a weeknight dinner! These nachos comes together so easily and are something that my family goes nuts for! 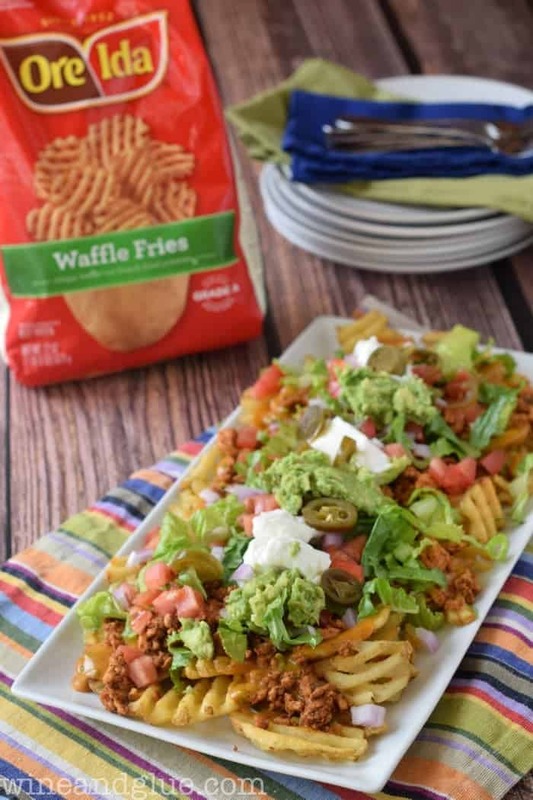 Because the best part about these Waffle Fry Nachos is that each person in the family can customize them just the way they want. Winning! For me? I will take them fully loaded, please and thank you. Bake the waffle fries according to package instructions. While the fries are baking, sauté the ground turkey over medium heat, breaking it up. Mix together the chili powder, salt, garlic powder, ground cumin, and cayenne pepper in a small bowl and then add it to the cooking meat. Add in the lime juice and continue cooking until the turkey is completely cooked through. 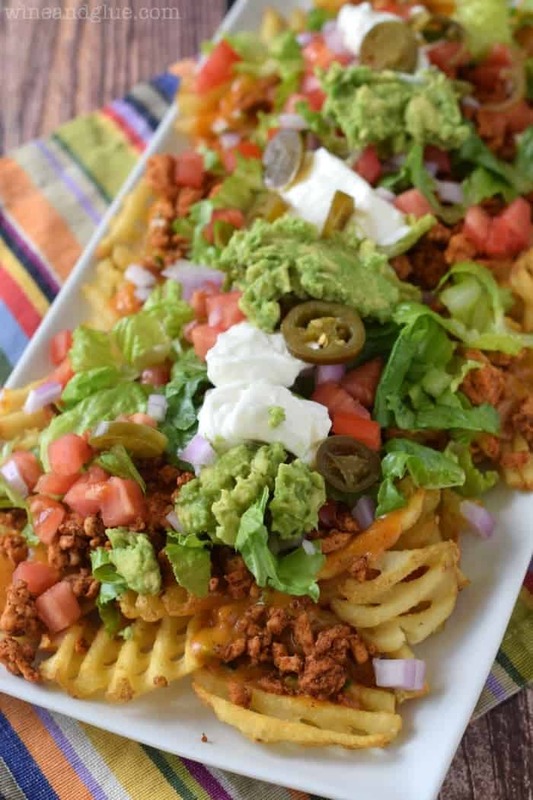 When the fries are cooked through and crispy, transfer them to a serving platter, top with queso, then the cooked meat, the lettuce, onion, tomato, jalapeños, guacamole, and sour cream.